In Part One and Part Two we looked at the basic structure, scope and workflow of Avid Media Composer. In Part Three we looked at how to optimize computer and project settings for best results. In this part we’ll look at how Avid Media Composer deals with different codecs, and how you can import them. The PMR file lists all the online media files. Every editing application consults all the PMR files in all the machine name folders to find out which media files are online. Whenever a media file is created, its name is immediately added to the creating editor application’s PMR file, and whenever a media file is deleted by its creator, its name is immediately removed from the PMR file. Only the codecs you have installed individually will show up. If you’re editing regularly with a varied client-base, it might be a good idea to install all the plug-ins at the beginning. Who wants to scramble for the right plug-in at the last moment while the client is watching? Avid puts this down to the ease with which they can update plug-ins when necessary, but that’s just them being lazy. I think they should consider your convenience above their own. Once you select the video file, it will show up in the selected bin, in its native format and wrapper. If you have DMF running, you can select a profile to execute on the specified folder. You can also create a new Import setting by going to your Project panel and choosing Settings. Right click on Import and select Duplicate. You can customize this import setting and use that to drag and drop files into bins directly. Import processes can be automated to make life faster. Read page 317 of the manual for more details. For batch importing instructions, read page 320. There are many codecs and container options out there. Just when you think you have a handle on things, a new codec is announced. It’s a way of life, which is unlikely to be ‘corrected’ soon. You always have to stay ahead of the game. Let’s look at a few codecs and how to deal with them. H.264 is the ubiquitous codec, and it looks like it will stay for quite some time. Avid Media Composer supports H.264 natively, via AMA as mentioned above. The Quicktime plug-ins are installed by default. For MXF plugins, use this link. The ‘new’ entrant to the H.264 family is just an interpretation of the codec with interframe turned off. Avid Media Composer supports it natively, via AMA as mentioned above. The Quicktime plug-ins are installed by default. AVCHD is a ‘version’ of the MPEG-4 AVC specification, or H.264, and Avid Media Composer supports AVCHD natively with the default plug-in (only in the MOV wrapper), via AMA as mentioned above. Avid says you’ll need to perform a one-time-only free activation of the Dolby AC-3 codec to use the plug-in, which happens in the background if you have an active Internet connection. For AVCHD not in MOV wrappers, you’ll need to download the specific plug-in here. Avid Media Composer treats XDCAM with kid gloves, so to speak. XDCAM and XDCAM HD follow the MXF OP1a standard, and need to be converted to MXF OP Atom. Similarly, XDCAM EX is MP4, and needs to be converted to the same. Use this link to download the XDCAM plug-ins. The utility that can do this is Sony Content Browser (The manual incorrectly still recommends the XDCAM viewer, which has been phased out). XDCAM codecs are supported at native resolutions only. To read the detailed guide, go to page 303 of the manual. For videos on the XDCAM and Avid Media Composer workflow, click here. For a detailed workflow guide, click here (PDF). At the time of this writing, there isn’t a plug-in for 4K XAVC, though XAVC Intra 100 is supported within Media Composer. This applies to files from both the XF series cameras as well as the Cinema EOS line (Cxxx). You’ll need to install the Canon XF and MXF plug-in from this link. Once that is installed, restart Avid Media Composer. You can then import it natively via AMA as mentioned above. HDV is still supported natively, in both transport stream form as well as wrapped as MOV, etc. The video file is rewrapped as MXF, but is used natively. Of course, you can also Capture HDV from a camera or tape deck directly. For DV and HDV, this method is preferable over Import… since you will also get important metadata and timecode this way (if the camera supplies it). Read page 1528 of the manual on how to work with HDV. Avid Media Composer supports Redcode RAW natively after you download the plug-in from this link. Audio files are converted to the WAV format. Arriraw is not supported in Avid Media Composer. You’ll need to transcode it while ingesting or recording to a suitable proxy format. Arri DNxHD is supported via plug-in that you can download from this link. You must first download and install the HDCAM SR plug-in from this link. Once that is installed, restart Avid Media Composer. You can then capture HDCAM SR. The plug-in supports MXF-wrapped SR Lite and SR SQ formats (422 YUV and 444 RGB) as transferred from HDCAM SR devices. Like H.264, Avid Media Composer supports MPEG-4 natively, via AMA as mentioned above. The Quicktime plug-ins are installed by default. For MXF plugins, use this link. X.264 is not supported by Avid Media Composer unless you rewrap it into a MOV container. The Quicktime plug-ins are installed by default. 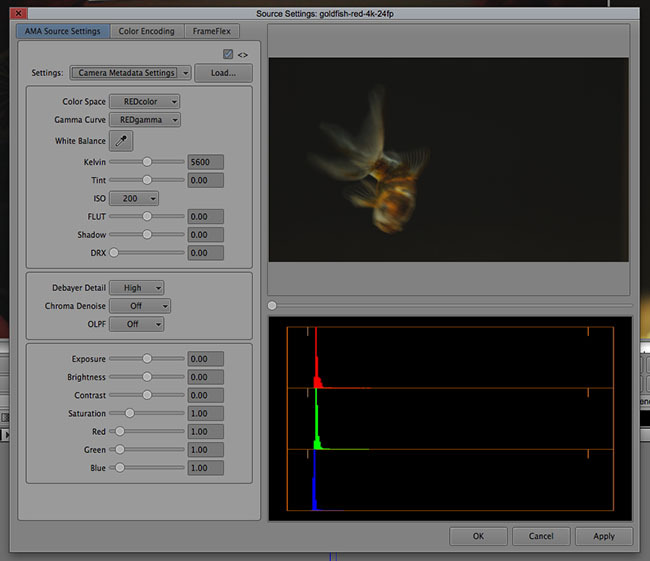 Prores works natively via the Quicktime plug-ins. If you use the AMA method, you can edit natively in MOV wrappers. If you want to use the other Import method, Avid rewraps the video into an MXF wrapper (codec is still Prores). This is Avid’s baby. All kinds of DNxHD are supported natively via either of the import methods mentioned above. Avid Media Composer does not support DPX, DNG or OpenEXR natively. You’ll need to transcode it to a supported format, via MetaFuze or another application. IMAGE SEQUENCES – TIFF, JPEG, PSD, ETC. Avid Media Composer supports many image types, up to 32-bit, and an alpha channel if necessary. Of course, this list isn’t exhaustive. For codecs and file types I’ve left out, check out page 1451 of the manual. I haven’t covered importing color bars and text patterns (page 300), Audio (page 289), layered PSD files (page 295), etc. For a detailed overview on how to use the AMA plug-ins, read page 398 of the manual. Once you import a video file, right click and select Source Settings… to control many parameters like size, color, gamma, etc. We have covered everything you need to know to set up your Avid Media Composer system, project and files. In this article, we have also covered some of the most popular codecs and how to import them. By now you should have a clear idea of how to import video into Avid Media Composer. I am just starting out, and taking a class on AVID Media Composer to be certified. The one thing I tend to have trouble with is understanding which codec to use when importing a certain codec or file. Understanding when to use which format and so fourth. I kinda understand codecs and containers but now I want to go depth to when is the best time to use what with what, what is the format to edit in with certain formats and etc. Does that make any sense? For ex. We shot a video in h.264 and now I am ready to import the footage into Media Composer. In the source browser, it gives me the Resolution drop down menu of APPLE PRORES HQ MXF, DNxHD 40 MXF, DNxHD 60 MXF, DNxHD 90 MXF, DNxHD 90 X MXF, J2K 720p, H.264 800Kbps Proxy MXF, etc. In this instance what is a few typical formats to choose from? Since it is H.264 do I go with that one? Or, a DNxHD file? I am just starting to learn the system and I want to make sure I learn and understand this right! which “manual” is being referred to with the above page numbers? where do I find this manual? Many thanks. How accurate is the DPX info from this? We got a 7Q and shot imbedded audio in DPX and all we simply want is a way to import video with audio and have Avid, or Adobe or FCP know that the A1 belongs to the V1. So far we have no easy solution, on any of the apps. We want to organize the imbedded audio with the clip, but not only inside timelines but also on a bin/folder level. How can we do this without a sequence for every single clip, in any application? So far Adobe seems useless, glue tools in FCP7 didn’t bring in the audio, Avid isn’t either…I mean call me crazy but shouldn’t there be an easier way to do this that won’t involved every darn clip needing its own sequence simply to keep my A1 with V1 in the bin/folder level? Please email merlenfx@yahoo.com thanks!! !